Undoubtedly the Ultimate level has a lot of benefits than Standard, Golden Membership, Emerald, Sappire, Platinum and Diamond upgraded Memberships. Some of the key benefits of Ultimate Membership are that you do not have to click ads daily as you get Unlimited Vacation Mode , you get more discounts with rented referral recycle and 7 day free auto recycle in Neobux. You can refer the below table to see all benefits of Ultimate Membership in Neobux PTC including yearly fee. 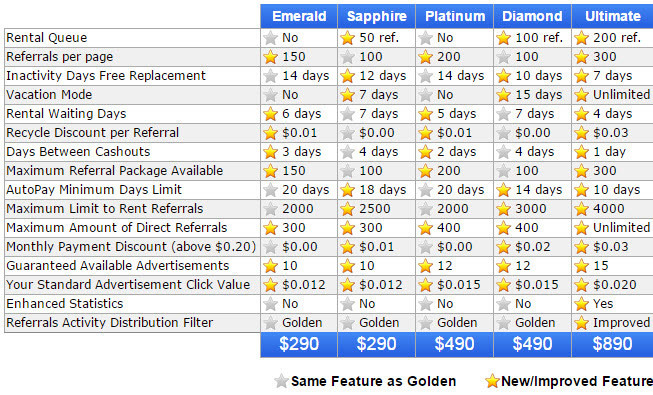 You should be ready to pay the $890 Ultimate Membership price plus a $90 Golden membership in Neobux ( Yearly fee ). So, you need to be prepared for a $980 cost. You should have enough Rented Referrals which will help you cover your referrals costs, renewals and make profits ( Without a decent number of rented referrals and/or direct referrals , Ultimate membership will not be worth for you). Study the strategies of Neobux closely so you can work on them towards achieving your goals as an Ultimate Member.